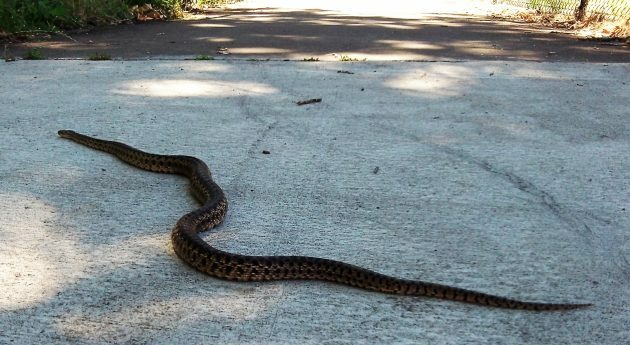 There’s an online fact sheet put out by the Oregon Department of Fish and Wildlife titled “Living With Snakes.” This fat little serpent, however, might benefit from something called “Living With Bicyclists.” Stretched out across the warm concrete of the Cox Creek Path on Friday, it was taking quite a chance. But it lucked out. I saw it in time and veered around it. The photo above is cropped for dramatic effect. In reality, the snake’s length covered about one-third of the width of the path. That would make it between three and four feet long. What kind of snake is it? The ODFW fact sheet says Oregon is home to 15 species of snakes. It has pictures and descriptions of each. None of the images matches my friend on the path exactly, but the one that comes closest identifies it as a gopher snake, also known as a bull snake. My acquaintance on the Cox Creek Path did none of that. When I stopped the bike and walked back to get closer, the snake slithered away, but ever so slowly, without losing its dignity one bit. No coiling, hissing or vibrating its tail. And then it disappeared in the weeds. No problem. If in doubt, almost all venomous snakes have “oval” shaped pupils like a cat and non venomous ones have round pupils. So if in doubt just get down on their level. Get real close and check the eyes. Not for you? Me neither. Just give them room and go about your business. A good thing this blog posting wasn’t titled “Eye to Eye: Snake Edition”. Made me chuckle though. HH, you are always good for adding things to my already long to-do list. Now I need to check out that ODFW snake info. I have my own large specimen residing in my backyard. He startles me every time. Lately, I’ve been directing his slither into the neighbors yard. But, like a good friend, he keeps coming back. Off to web search now.